In response to our recent Flickr Commons set highlighting women in science, Erin, our colleague from Smithsonian Libraries, did some deeper digging into one of the portraits in the mostly male Portraits of Scientists and Inventors set. Nadar's portrait above is wonderfully fanciful in comparison to some of the more staid portraits of these scientists. Felix Nadar, aeronautical scientist and photographer, became an unexpected star of the Smithsonian Libraries’ Dibner Portrait collection in The Commons on Flickr. Although probably not a household name these days (and definitely not under his given name - Gaspard-Félix Touranchon Tournachon), Nadar was quite a character in 19th century France. Luminaries of all kinds, including George Sand and Marcel Proust, flocked to his Paris photography studio for portrait sittings. He was also a regular contributor to several French comic papers. 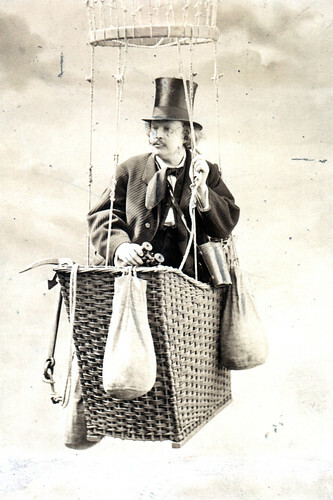 This unusual portrait, showing Nadar aloft in aboard one of his balloons, has been featured in the online exhibit Scientific Identity: Portraits from the Dibner Library of Science and Technology for more than five years, but it wasn’t until Nadar made his debut on Flickr that he gained internet popularity. He is now a favorite of more than 200 people and featured in such unusual Flickr pools as “Basket World”. A colorful figure of the 19th century finding a new fanbase in the 21st! Erin Rushing of the Smithsonian Institution Libraries.